During his campaign, President-elect Donald Trump railed against so-called pay-to-play politics and started a rallying cry to “drain the swamp” in Washington. Despite this strong rhetoric, journalists and politicians have noted that Trump’s cabinet nominees actually epitomize a system rigged to benefit large corporations at the expense of the public good. His nominee for administrator of the U.S. Environmental Protection Agency, or EPA—Oklahoma Attorney General Scott Pruitt—is no exception. During his career, Pruitt has demonstrated that, given a choice, he will side with large, polluting corporations over the environment and public health, including the health of children. Every time. In 2014, a New York Times investigation found that Pruitt participated in an “unprecedented, secretive alliance” between Republican attorneys general and large fossil fuel companies with the goal of collectively fighting federal pollution limits. Pruitt defended this work, stating: “That’s actually called representative government in my view of the world.” After he was nominated for EPA administrator, dirty energy company executives created a “secretive” organization to collect millions of dollars in undisclosed contributions to support his confirmation and ensure that he could represent their interests at the highest level. These companies are investing in someone who has proven throughout his tenure as Oklahoma attorney general that he shares their values. Power plants are the largest source of toxic mercury, which can cause brain damage in children exposed to it while in utero. This damage can lead to “a variety of developmental neurological abnormalities, including delayed developmental milestones, cerebral palsy, and reduced neurological test scores.” Simply put, mercury exposure can impede a child’s ability to think and learn. In December 2011, the EPA finalized the first-ever limits on mercury pollution from power plants. The EPA estimated that, when fully implemented, this rule would cut toxic mercury emissions from the power sector by 90 percent—a big win for children’s health. It also would prevent as many as 11,000 premature deaths and 130,000 asthma attacks by reducing other pollutants as a co-benefit. As attorney general of Oklahoma, Pruitt made a choice. He joined with electric utilities and coal companies to sue the EPA to block the new mercury standards and against children’s right to meet their full potential. In the United States, the oil and gas industry is the largest industrial source of methane, a supercharged global warming pollutant. Methane emissions from oil and gas operations often are laced with other dangerous pollutants, including smog-forming volatile organic compounds and air toxins. This pollution can have serious impacts on the daily lives of people who live near oil and gas operations. The Clean Air Task Force estimates that each summer, ozone smog resulting from oil and gas pollution contributes to more than 750,000 asthma attacks in children under age 18. This pollution also causes children to miss 500,000 days of school nationally each year. In May 2016, the EPA finalized the first-ever federal limits on methane pollution from the oil and gas sector. The EPA estimates that these standards will prevent the release of 510,000 short tons of methane in 2025, which is equivalent to taking 2.4 million cars off the road or running three coal-fired power plants for a year. The standards also will avert the release of 210,000 tons of smog-forming volatile organic compounds and 3,900 tons of air toxins each year. After the EPA finalized the rule, Attorney General Pruitt made a choice. He sued the EPA to block the new methane pollution standards and against the right of children—and adults—to breathe cleaner air. Air pollution knows no boundaries. That’s why the Clean Air Act includes a “good neighbor” provision that requires the EPA and states to reduce soot- and smog-forming air pollution in upwind states when that pollution prevents downwind states from meeting health-based air quality standards. In 2011, the EPA finalized the Cross-State Air Pollution Rule to cut pollution in 22 states. This rule affects air quality and public health locally, regionally, and even in communities hundreds of miles downwind. The EPA estimated that the rule—once fully implemented—would prevent as many as 34,000 premature deaths, 15,000 non-fatal heart attacks and 400,000 asthma attacks every year. It also estimated that the rule would prevent 10,000 trips to the emergency room for children with asthma. Attorney General Pruitt made a choice. He sued the EPA to block the good neighbor rule and against the right of children—and adults—to healthy lungs. Unmitigated climate change poses a significant threat to the health and quality of life of all Americans. In June 2013, President Barack Obama announced the Climate Action Plan to cut greenhouse gas emissions in the United States. In describing his motivation, he said: “Someday, our children, and our children’s children, will look at us in the eye and they’ll ask us did we do all that we could when we had the chance to deal with this problem and leave them a cleaner, safe, more stable world.” In August 2015, the EPA tackled one of the largest sources of emissions—the electric power sector—and finalized the Clean Power Plan, setting the first-ever limits on carbon pollution from power plants. Attorney General Pruitt made a choice. He immediately sued the EPA to block carbon pollution standards for power plants against the right of children—and those children’s children—to grow up in a world free of the dangerous effects of climate change. Some observers may look at Pruitt’s track record and conclude that this is just politics as usual. 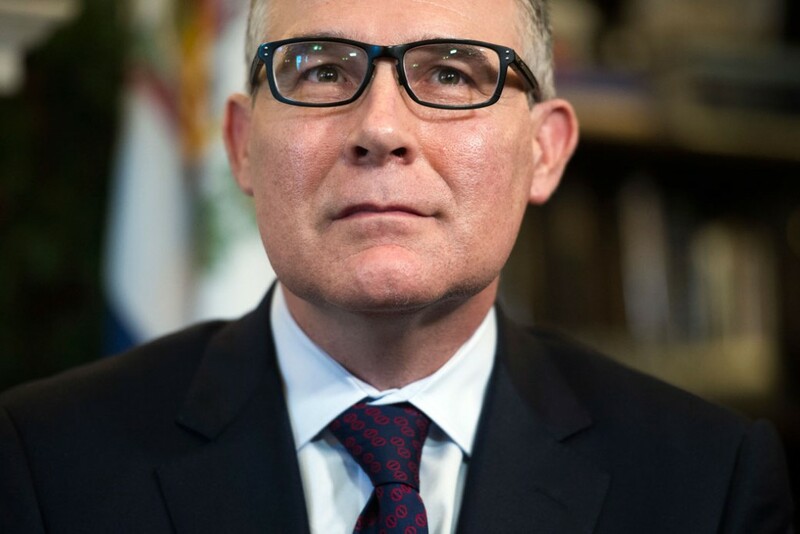 But such a view presumes that his choices to sue the EPA to block important public health protections were a foregone conclusion—that he was simply acting as a typical politician. That line of thinking lets Pruitt off the hook. In truth, he made a choice each time that he decided to litigate. He chose to prioritize polluters over public health. Americans need to ask themselves: Is that who they want running the Environmental Protection Agency? * Author’s note: See Federal Elections Commission, Republican Attorneys General Association 527 disclosures (2013-2016), on file with author.